In his inaugural address in 1993, President Clinton said: "I challenge a new generation of young Americans to a season of service to act on your idealism by helping troubled children, keeping company with those in need, reconnecting our torn communities." In the fall of 1990, Suzanne Goldsmith had signed on for her own "season of service" with City Year, the widely praised, Boston-based community service program frequently endorsed by political figures as a model for the nation. 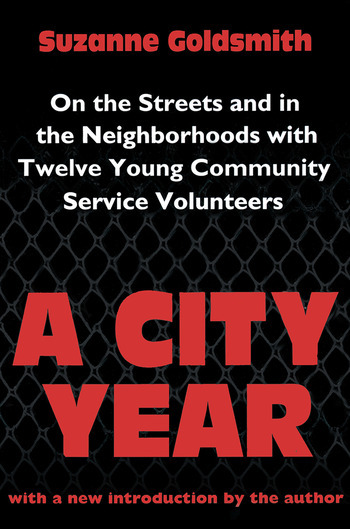 'A City Year' is the story of Goldsmith's experience, an honest and gritty account of the triumphs and setbacks faced by an idealistic and experimental social program in its infancy. Together with a diverse team of young men and women--including a Burmese immigrant, a white prep-school graduate, a foster child, an ex-convict, and a black middle-class college student--Goldsmith helped renovate a building for the homeless, tutored school children, reclaimed a community garden from drug dealers, and organized a community street-cleaning day. The year Included backbreaking but gratifying work, the sense of family that comes from collaborative labor, and the potential strength of diversity. 'A City Year' is both the story of an uphill battle in urban America and an uplifting recipe for social change. As the AmeriCorps national service program dangles in the political wind on Capitol Hill, this book offers a true glimpse of what a "season of service" really means. It is a fascinating account for sociologists and all those with an interest in community service and youth.